Batman: The Brave And The Bold: "Time Out for Vengeance," "Sword of the Atom!" and "Triumvirate of Terror!" "Time Out for Vengeance," "Sword of the Atom!" and "Triumvirate of Terror!" / "Time Out for Vengeance," "Sword of the Atom!" and "Triumvirate of Terror!" / "Time Out for Vengeance," "Sword of the Atom!" and "Triumvirate of Terror!" "Time Out for Vengeance," "Sword of the Atom!" and "Triumvirate of Terror!" You might have noticed that there’s been a weeks-long hiatus in the A.V. 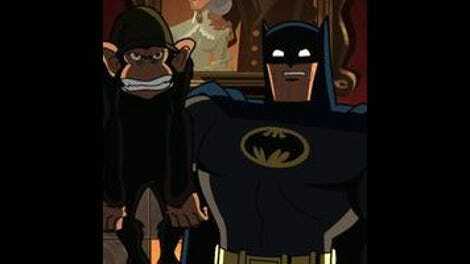 Club’s Batman: The Brave And The Bold coverage. This is mostly because we were waiting for Cartoon Network to decide what exactly they were going to do with the show. As of now, they seem to have given up on Brave And The Bold and decided to make the remaining episodes available only through iTunes. I’m not sure if these last few episodes in the show’s final season will air anytime soon on Cartoon Network. Needless to say, the decision to pull the episodes from airing on TV is a pretty disappointing vote of no confidence from Cartoon Network’s execs. While I’d love to argue that at it’s best, Brave and the Bold is leaps-and-bounds better than most of the other original programming Cartoon Network currently has on the air, I’m not going to do that. I don’t know how poorly the show has been doing in terms of its ratings, and I don’t particularly care to find out. That information has very little bearing on the parts of the show I want to critique and/or praise. To wit, there’s no point in complaining about a business decision that was made based on factors I simply don’t care about. So as tempting as it might be to do so, I’m not gonna go there, gentle reader. Instead, let’s talk about what’s been happening with Brave And The Bold in the last three weeks. Recently, Brave And The Bold has been struggling to find its legs and maybe the right place to end. Prior to this, there weren’t too many exemplary episodes to latch onto. Even veteran comics writer J.M. Dematteis cranked out a couple of sub-par scripts, sleep-walking through “Shadow of the Bat” and “Scorn of the Star-Sapphire.” But he bounced back with “Time Out for Vengeance,” an episode that has a richer and more personal sense of humor to it than his previous contributions to Brave and the Bold’s third season. Just look at the B-narrative that opens “Time Out for Vengeance:” the manic, half-formed lines from old comedy routines that the Creeper tosses off, including Abbott and Costello’s “Who’s on First” routine, dates the episode’s sense of humor in the best way possible. I say that being dated is an asset in this case because Dematteis is working with characters that he knows and has a winning track record with. Working with the Justice League International, a team that he, Keith Giffen, and Kevin Maguire made iconic in the 1980s, is a no-brainer. This is familiar territory for Dematteis, and he’s clearly in better form here than he has been during most of his time with Brave And The Bold, with the major exception of his script for season one’s “Hail the Tornado Tyrant.” Never mind the fact that Dematteis basically ripped off the idea of having the JLI go back in time to rescue various Batmen, including a cave-Batman and a pirate Batman, from Grant Morrison’s excellent recent comic mini-series The Return of Bruce Wayne. What matters is that many of Dematteis’ jokes stick, like Guy Gardner and Fire’s banter or all of cave-Batman’s dialogue (“Cave?! Haha, cave no place for secret hide-out. This Bat-Tree!”). “Time Out For Vengeance” can be seen as a decent conclusion to Brave And The Bold, or at least, a nice preamble towards one. I’m not sure if “Triumvirate Of Terror,” last week’s episode, will be the show’s de facto finale, but “Time Out For Vengeance” at least has a tacked-on ending that worked. While “Triumvirate of Terror” is fine for what it is, it’s mainly a wholly unremarkable set-up for a lame, foregone thematic conclusion: Batman, Wonder Woman, and Superman are an immortal trio that can never be defeated. That ending seems almost counter-intuitive to Brave And The Bold’s main hook, namely that Batman will team-up with whomever in the DC Comics universe is available at the time. 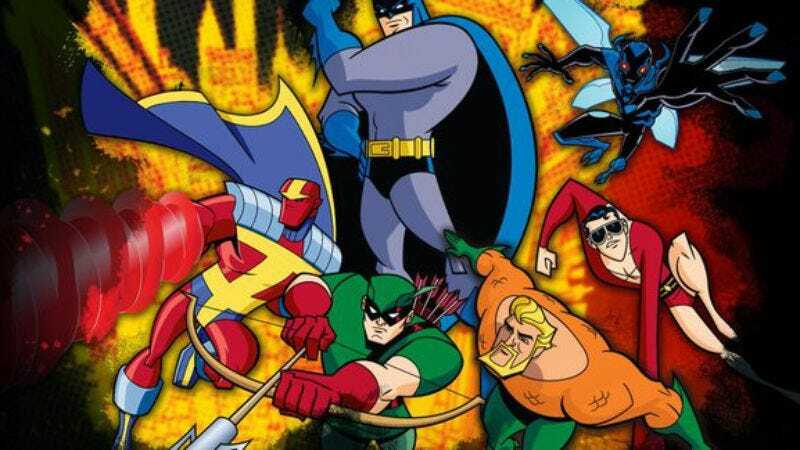 The central novelty of Brave And The Bold is the idea that there’s a whole universe of characters in DC’s stable other than their three biggest characters. “Time Out For Vengeance” acknowledges that and sets us up for more potential team-centric adventures by re-introducing an old villain. “Time Out For Vengeance” works on a couple levels and definitely deserves recognition for that. That having been said, I wouldn’t call “Time Out For Vengeance” the best of the last three Brave and the Bold episodes to recently air. That honor goes to the superb “Sword Of The Atom!” This episode is not only consistently hilarious thanks to the very winning pairing of the boastful Aquaman with the meek Atom (Ryan Choi, not Ray Palmer). “Sword Of The Atom” is also a great mirror version of season one’s “Mystery In Space” episode, wherein Batman has to convince Aquaman that being a superhero is still a worthwhile calling. If you replace the hero in trouble with the Atom, make Aquaman the cockier and self-assured hero that leads his doubtful partner back into the fold, and replace Adam Strange and the planet Rann with Palmer’s Atom and a South American jungle, you’ve got pretty much the same episode. In that way, “Sword Of The Atom” screenwriters Thomas Pugsley and Steven Melching not only delivered a very funny and sharp script unto itself but one that delivers on Brave And The Bold’s main premise of championing narrative symmetry. The joy of adventure that Aquaman tries to impart to Choi is apparent throughout Pugsley and Melching’s script. Their gleeful tweaking of generic expectations, like in the opening, sitcom-style sequence where Black Manta is caught trying to plant a bomb in Aquaman’s mailbox for the nth time, makes for a very funny and consistently sharp episode. Had the Brave And The Bold ended there, iTunes drama or no iTunes drama, the show would have ended on a perfect note. "Time out for Vengeance:" B+. "Sword of the Atom:" A.